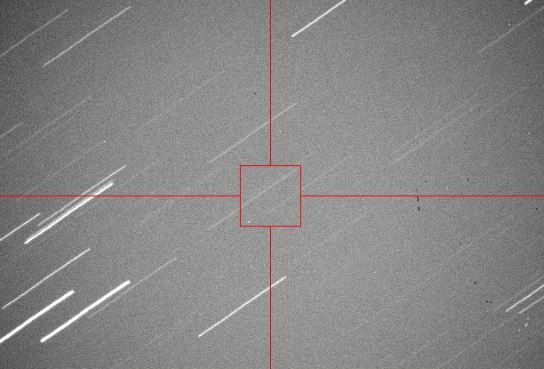 A newly found asteroid, 2013 EC can be seen in the lower left corner of the red box in this image. Screen capture from Virtual Telescope webcast on 3/3/2013. A newly found asteroid will pass just inside the orbit of the Moon, with its closest approach on March 4, 2013 at 07:35 UTC. Named 2013 EC, the asteroid is about the size of the space rock that exploded over Russia two and a half weeks ago, somewhere between 10-17 meters wide. The asteroid that sparked the Russian meteor is estimated to have been about 17 meters wide when it entered Earth’s atmosphere. 2013 EC was discovered by the Mt. Lemmon Observatory in Arizona on March 2. There is no chance this asteroid will hit Earth. 2013 EC will come within 396,000 kilometers from Earth, (246,000 miles, or around 1.0 lunar distances, 0.0026 AU. The Moon’s distance from the Earth varies between 363,104 km (225,622 miles) at perigee (closest) and 406,696 km (252,088 miles) at apogee (most distant point). China Overtakes the US to become the World’s Largest Oil Importer Considering the recent Meteorite that struck Russia…could this be somehow related to the undiscovered Comet?